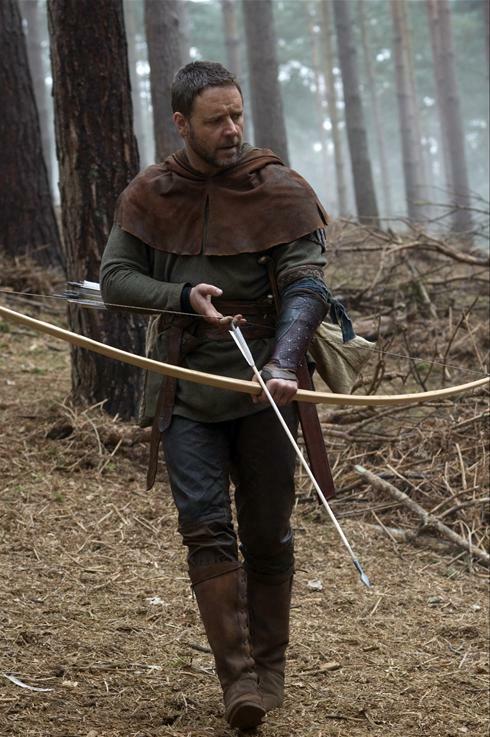 There are definitely different location directors or some other such issues of inconsistency in this re-telling of the Robin Hood legend, for this unduly long Russell-Crowe vehicle is uneven and at times incoherent...even though it's ultimately interesting throughout the broad middle. However, with its Showtime-level focus on historical “authenticity” mixed with its 300-style fight scenes and “release the Kraken!” level dialogue, I can see how it might be falling in between the cracks of different audiences, racking up poor reviews, and failing to gather the viewings that its studio might hope. Basically, Russell Crowe and director Ridley Scott have set out to remake the classic Robin Hood story as a star vehicle for Crowe, so though we get appearances from Big John and Friar Tuck, this reimagining is less “one for all” than it is “all for one.” They've also chosen to make this an origin story - essentially the setup for how the band of merry men assemble, all foreplay for the main action to come in a (perchance) next sequel, much like the recent Star Trek. However, the first act of what we get here is practically indecipherable: it seems like we’re watching the outtakes reel from Lord of the Rings. King Richard the Lionheart is sacking French castles on his way back from fighting the crusades (at times, the movie – unintentionally? – slides into Montey-Pythonesque dialogue, including French taunting and phrases like “though shall not pass until thou answereth my riddle”; I was surprised not to be treated to a refrain of “Bring out Your Dead.”) When Richard is slain, Robin sees his opportunity to desert the army (out of moral rectitude, mind you – the army has killed innocent women and children), and he and his band of merry men head for the hills, and eventually to England. Upon their arrival they find themselves in the midst of castle intrigue, as Richard’s younger brother, John, seeks to defy his mother (and get out from his older brother’s shadow) by appointing a new commissioner: movie heavy Godfrey, whose job is to collect taxes from the noblemen (though his secret plot is to sow dissent so he can lead a French invasion of England). Godfrey suspects that Robin knows his secret, and so the blood feud emerges: this section of the film could well have been right at home in any episode of "The Tudors." But it’s once we get into this second act – and a clear cat-and-mouse game takes over the plot – that the movie starts to get its legs, and where it began to win me over. Robin is a warm-hearted, stolid sort who ends up hiding out posing as the son of a deceased lord at Nottingham; Sir Walter Loxley (played by Max von Sydow), knows Robin from childhood and asks him to stand in for the deceased son – and play the husband of his daughter-in-law, Maid Marion (Kate Blanchett). The courtship of Robin and Marion is nothing new, but Blanchett and Sydow both bring a commanding force to the movie that centers it emotionally, something the first act lacked totally. Blanchett as always is immensely watchable as a woman fending for her honor and dignity in a world ruined by men. Given the subject matter of this film – essentially about a King who ruins the wealth of his country through needless foreign wars, and his successor who needs to make up for it by excessively taxing his countrymen at home…and the bandit that will eventually decide to redistribute the wealth on his own – one might expect the film to capture some of the spirit of the Tea Party, or give some other political allegory for our time. But this film largely stays away from political overtones. When Robin finds out that his long-dead father was a “visionary” who foresaw a brotherhood of free Lords who had rights under the King (the film essentially posits Robin Hood as the origin of the Magna Carta), and takes up his cause, it’s less about politics than it is about sons discovering the legacy of their fathers. Ultimately, although the plot puts Robin in the center of the Lords' power struggle against King John, this is a movie about sons becoming leaders – via fighting, courage, honor, and finally, even a sense of love. So even though this film was dreadful at the beginning, by the time we find Robin giving a speech to the nobleman about uniting to defend England in exchange for rights and liberties, I’ve come to find I rather like this charming lout and his band of good-hearted mercenaries. I think that’s the effect that Robin Hood is going for: something about how justice and vision are something grown organically, out of the rough-and-tumble of fighting, mead, and mud. That rough-and-tumble philosophy does pervade all aspects of the film – from the directing, which is all over the place in style, and borrows heavily from modern films ranging from Saving Private Ryan to 300 (we get a beach-invasion scene which seems like the love-child between the two) – to the dialogue, which barely bothers to get the Middle-English colloquialism sounding half-right. Still, a movie doesn’t have to be perfect – just enjoyable – and by the end, this one is. This is by far no masterpiece, but whether intentionally or not, Crowe and Scott have created a muddy mess with a simplistic but affable moral center: kind of like that Robin Hood character himself.